NATS has created a wonderful platform for all the Telugu people residing in North America to make them understand our culture and traditions by conducting various programs and also by giving an opportunity to showcase their talents in various fields. 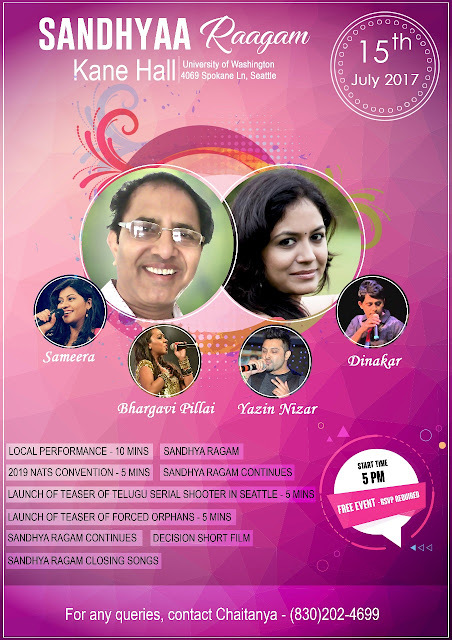 As a part of this celebration, we have a musical concert by famous Tollywood music director Mr. Vandematram Srinivas and renowned singers from Tollywood like Sunitha, Yasin Nazar, Bhargavi Pillai, Dinakar and Sameera Bharadwaj on 15th July @ Kane Hall, Seattle at 5pm. Not only that, we are releasing the teaser of a crossover film ‘Forced Orphans’, entirely shot in US, starring Ankita, directed by VN Aditya, produced by People Media Factory during this musical concert. We request you all to be a part of this free event co-sponsored by People Media Factory and enjoy the event. So, why delay… please be part of these wonderful celebrations and make it a grand success!